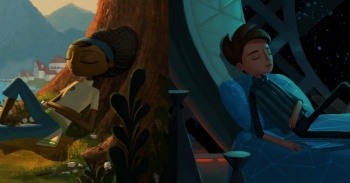 A new website reveals some more information on Double Fine's upcoming adventure game, including its title: Broken Age. When Tim Schafer, creator of Phsychonauts and Brutal Legend asked for money to make a new "Double Fine Adventure" game, the internet threw cash at him as fast as they could. The game's kickstarter raised an incredible 2 million dollars in just two weeks. Schafer was completely bewildered by the sheer amount of backers, and had to quickly come up with details for this game that everyone was throwing money at. The game now has an official website, which reveals a small blurb about the story, as well as the name of the game: Broken Age. "Broken Age is a point-and-click adventure telling the stories of a young boy and girl leading parallel lives," is written on the website's about section, "The girl has been chosen by her village to be sacrificed to a terrible monster--but she decides to fight back. Meanwhile, a boy on a spaceship is living a solitary life under the care of a motherly computer, but he wants to break free to lead adventures and do good in the world." Broken Age is the result of Double Fine sidestepping traditional video game publishers to give their fans what they want: a classic-style adventure game in the vein of Grim Fandango or Monkey Island. "And ever since day one, 2 Player Productions has been recording the whole process in an ongoing series of in-depth episodes documenting the creation of a game," says Double fine. "By becoming a backer, you can follow the game's development as it progresses!" You can become a backer by pre-ordering the game from the Broken Age website. There are currently two flavors of pre-order, a $15 edition that includes beta access, and a $30 edition that comes with the aforementioned backer access. Further details of the game are still unknown, but will be sure to unfold as the game develops.